In the future, the United States does not want to rely on foreign countries for oil. Luckily, the state of North Dakota is one of the newest oil hot spots. Along with parts of Montana, Saskatchewan, and Manitoba, North Dakota is home to the largest accumulation of oil in the Lower 48 states. It's bigger than Louisiana, Texas, California, and Alaska's Arctic National Wildlife Refuge. It's called the Bakken Formation. The USGS is conservatively estimating that there are between 3.5 and 4.3 billion barrels of oil two miles below the plains and ghost towns of western North Dakota. With current prices of oil as high as they are, the oil rich lands of North Dakota is sitting on an oil jackpot. The Bakken Formation is causing people to rush to North Dakota. There are jobs to be had for people willing to work in the region, and who have certain skill sets and knowledge. Because of good hourly wages and overtime, and a shortage of workers, earnings potential is high. The oil industry and those industries that support it are welcoming hard workers with open arms. The whole region is exploding with potential. 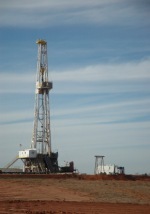 Oil wells are going up all over the place. Now there are more than 5,400 wells in North Dakota (a couple hundred are active) with a high percentage of those tapped into the Bakken Formation. Many wells bring in around $1 million a year and creates over 100 direct and indirect jobs. Find High Paying Oil & Gas Jobs! Start Your Search Today! The sudden explosion in North Dakota oil means that workers are in high demand. It's not to say that anyone can just get a job, but with training and a willingness to work hard there are jobs available that have all been created by the Bakken Formation. OilJobFinder will supply you with direct links to North Dakota employment information, oil companies operating in the region, local community information, Bakken Formation statistics, North Dakota data, and with other information you may want to know about the current oil boom. Who knows what type of oilfield job might be the perfect fit for you? And other employment opportunities including: Water Hauler, Surveyor, Welder, Heavy Equipment Mechanic and Operator, Trucker, Reservoir Engineer. The Bakken Formation is no joke. Companies are eager to hire hard workers who will come to North Dakota to help extract massive quantities of oil. Oil opportunities like North Dakota's Bakken Formation may only come around once in a lifetime. The Bakken Formation is truly significant to the oil industry. This is your chance to take advantage of the high demand for oil field workers and make a lifestyle change that will set you up for a long and successful career. Let OilJobFinder provide you with information you need as a job seeker. As a member you'll learn about all of these jobs in detail, where to get training, get current job advertisements, find out who's hiring right now, and much more. As a Member of OilJobFinder you'll have access to even more information about oil exploration careers, the specifics of each job type, and how people working in exploration interact with production workers and others in the industry. Use OilJobFinder to help your find your dream job. There are thousands of open jobs right now. Simply click the button below to start your job search.